The following table lists the ten worst performing FTSE 350 stocks in 2015. These ten stocks form the 2016 Bounceback Portfolio. The final column in the above table also gives the returns for each stock for the period Jan-Mar 2016. For example, Anglo American shares fell 75.1% in 2015, and then rose (bounced back) 84.4% in the first three months of 2016. 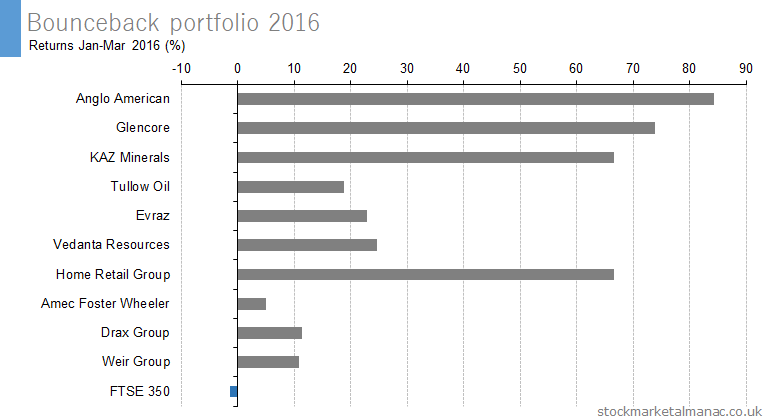 The performance of the 10 Bounceback Portfolio stocks for Jan-Mar 2016 is shown in the following chart. 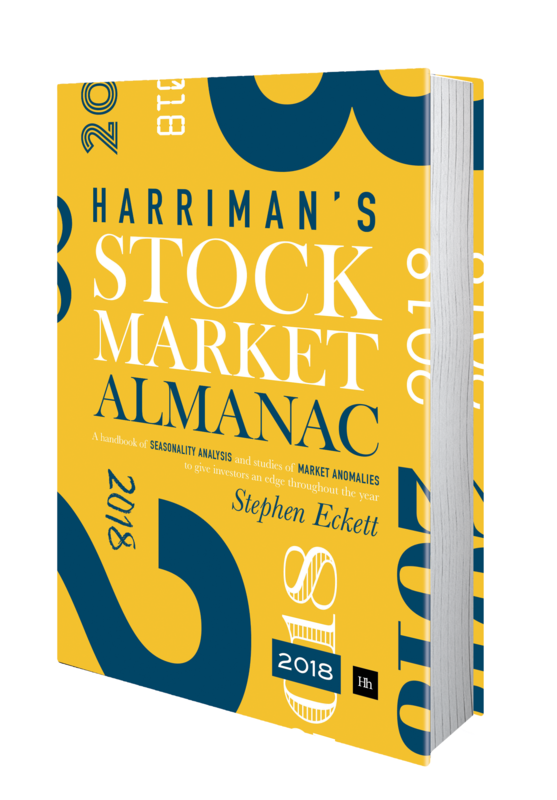 On average the Bounceback Portfolio stocks had a 3-month return of 38.5%, compared with a FTSE 350 Index return of -1.4% for the same period. The Bounceback Portfolio has been running since 2003. 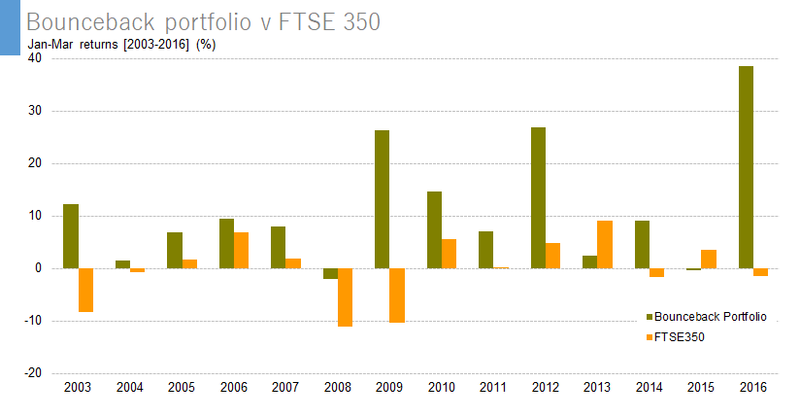 The following chart shows the comparative performance of the portfolio and the FTSE 350 Index for each year. 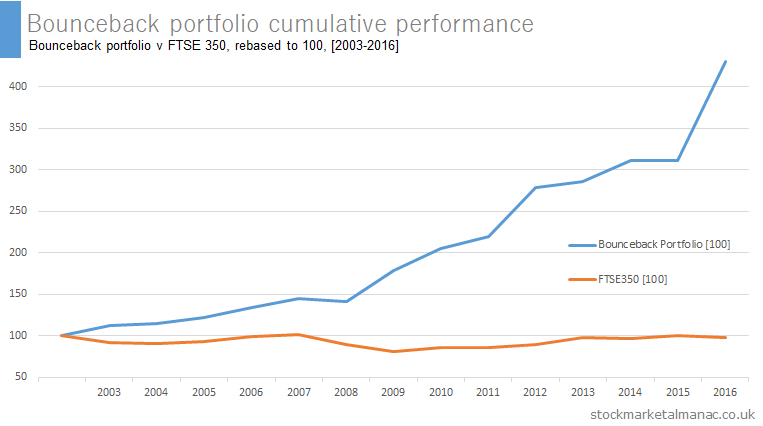 As can be seen the Bounceback Portfolio scored its greatest out-performance of the FTSE 350 in 2016. Since 2003, the Bounceback Portfolio has under-performed the index only twice (2013 and 2015). The following table shows the 13 FTSE All-Share stocks that have had the highest number of consecutive negative annual returns to end 2014. The last column gives the number of years of consecutive negative returns. For example, First Group has not had an up year since 2007, and so has had seven consecutive years of negative returns up to 2014. The following table shows the top ten performing shares in the FTSE 350 Index for the first six months of 2013. And the following table shows the worst ten performing shares in the FTSE 350 Index for the first six months of 2013.